"Yeah, I am disappointed. I have expectations and I was hoping for something better ... I'm used to running PRs." Jenny Barringer, after setting the outdoor collegiate record in the women's 5k at Stanford. Derrick over Fernandez! 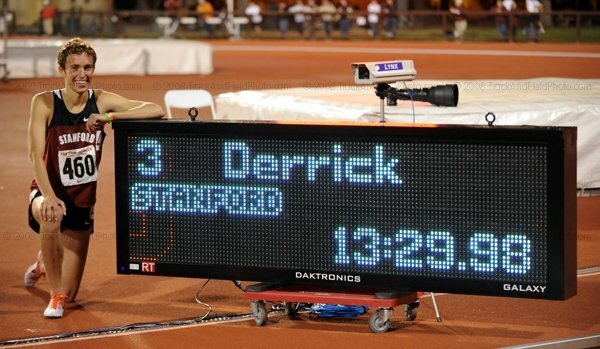 Derrick the new American Junior Record holder! The NY Times Looks At How Many Colleges Are Cutting Sports Due To Recession While Other Schools Are Flush With Cash Interesting to learn that MIT cut 7 sports, while UW cut its swimming teams and Cincinatti its scholarships in track/cross-country. Meanwhile, SEC schools are so loaded with sports $$ that Arkansas is giving $1 million to the University to help it out. *UCLA - USC: USC Sweeps Mens & Women's Dual For 1st Time Ever The UCLA women almost never lose to USC (2nd time in 17 years) but they did this year. Click here to see a ton of highlight videos (guys and girls in tears at USC about the win). Click here to see video replay of meet. Ethiopian Champs Day 3 & 4 Recap Women's steeple was the highlight. She's Back! Deena Kastor Returns To Form As She Gets Win In her first big race since last year's Olympic injury, Kastor dominated as she took command on the first big hill just 3km in the race as she crushed 3-time champ Jelena Prokopcuka as well as former world 10km champ Sally Barsosio, who was 3rd. Next Up: Bay To Breakers On May 17th. *Deena Kastor's Excited To See Return From Broken Foot Continue In Scotland Interesting - she says emphatically she wants to run in London 2012 at age 39. Interesting Read: Race Shows Contrasting Worlds Between Richness Of West & Poverty Of Kenya An interesting look into what life in Kenya is truly like. This meet didn't disappoint. Third place of heat 2 of the 5k may have been the highlight as Chris Derrick defeated fellow frosh German Fernandez to get Galen Rupp's American Junior Record in the 5k. Jenny Barringer has been so good in 2009 that she set a collegiate record while running slower than she did indoors. She was actually disappointed with her collegiate record. The premier pre-meet event, the men's 5k, didn't quite live up to its hype as a slow second mile killed any chances of a World Championships "A" qualifier, as Alistair Cragg outkicked Matt Tegenkamp to win in 13:22. Videos from top races from Runnerspace on the right of the home page and more from Flotrack. "I used to play judo and the art of playing judo is take the force andpressure on you and return it to throw your opponent - and this is the moment for the Olympic movement to throw its weight behind that brand and reaffirm its values." - Seb Coe's take on how the Olympics fighting cheating in sports can be a model to fight cheats in all walks of life. *Jason Stewart Says He And Nick Willis Had Their Suspiscions About Ramzi ... as did pretty much everyone else who follows running. Stanford Payton Jordan Highlights (You Can Fast Forward To The End Of Each Race). Chris Derrick American Junior Record 13:29.98!